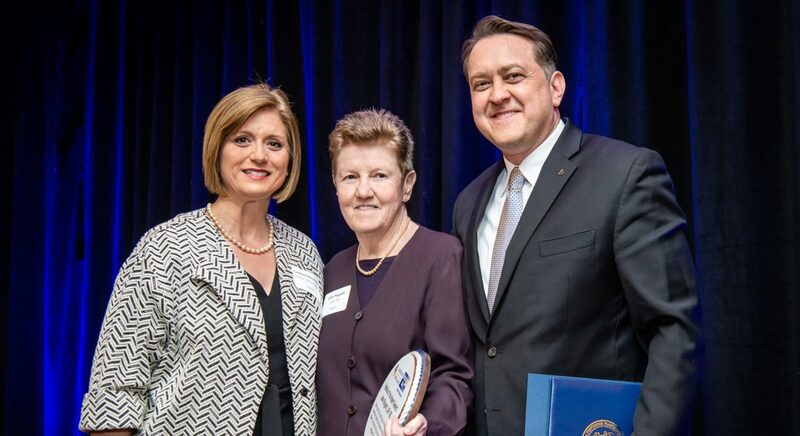 Jane Nugent has spent 22 years of her career working for the United Way of Rhode Island and 29 years as a volunteer for Leadership Rhode Island. Good afternoon friends, family, guests, sponsors, donors, colleagues, LRI staff, CLRI Class of 2019, alumni and Omicron II’s. It is with great honor and humility that I accept the Habits of the Heart Award from Leadership Rhode Island and United Way of Rhode Island. Mike asked me to reflect on the intersection of my life with Leadership Rhode Island and United Way…both non profits committed to civic engagement. So, knowing that you have lives to live and places to go, I’ll offer some brief remarks on just a couple of stage setting early LRI/United Way encounters. My first encounter with LRI, thanks to Bill Allen, a United Way colleague and LRI graduate, was in 1990 when I was a fairly new employee of United Way. With all due respect and very late apologies to both LRI and United Way, I delivered a “room clearer” of a talk to the Kappa Class when I put forward a “Marshall Plan for Non Profits” which called for: mergers, consolidations, collaborations, partnerships, results and accountability! I pause here to welcome Cortney Nicolato to Rhode Island as the new President of United Way. And for any grief you might encounter because of my early “skunk at the garden party” remarks, please talk to Bill Allen! Then, I had the good fortune to be sponsored by United Way for the original Omicron Class of 1995 and also to be class speaker. As part of my remarks on October 25, 1995, twenty four years, ago, I said: “Most people involved with LRI are deeply engaged in community life…some because of LRI, some because they came to the experience already passionate about a community cause. We know that because of the Leadership Rhode Island experience we are expected to do more. We are not unmindful however of how difficult it is to make concrete, tangible sense of this thing called ‘community trusteeship.’ We see a desperate need for our major institutions to be problem solvers at a time when they seem least able to respond. I noted then, that E.J. Dionne, a columnist for the Washington Post, and family friend (we grew up together on the same street in Fall River, Massachusetts) framed the challenge this way. He said in his 1991 book – Why Americans Hate Politics – “As a nation our discontent grows from a nagging worry that we have lost our sense of common citizenship. Divided by bitter debates, torn by growing inequalities, Americans have become increasingly skeptical about whether civic engagement can produce much of value. A nation whose people often perform brilliantly as individuals, now questions whether it can respond collectively to its problems” ….words that might still have resonance today. But through the years, I’ve come to appreciate and believe in the insights of Alexis deToqueville, having been reintroduced to deToqueville by United Way which honors his memory yearly. DeToqueville was the author of Democracy in America, which he published in 1835. He coined the phrase “Habits of the Heart” to describe what he saw about civic engagement starting right here in Rhode Island, landing in Newport to begin his work. He saw Americans coming together freely to identify community issues, discuss solutions and start to act on them. This is a huge challenge before us today – especially today—to believe that we can give of our time to improve the quality of life for others, while working with others…others who are different, who don’t look or talk or act or believe the same. But others who share a desire for better lives for all in this country we call the United States of America. Whether we live in red or blue America, we embody similar values: we share our hospitality; we show up for people; and we keep showing up for them. So, while each of leaves here today essentially alone, it’s really better to go in two’s and three’s, and maybe even four’s and five’s to live out David Brooks claim that: We are born into relationships, and the measure of our life is in the quality of our relationships. If we can change the lens through which people see the world, then we can change the way people want to be in the world and act in the world. So that’s our job. To shift the world, so that it emphasizes Me less and We more.